The newly formed Hero MotoSports Team Rally is all set for its debut international event. 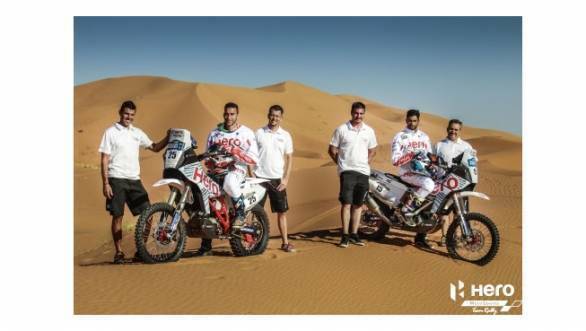 The team which is a collaboration between Hero MotoCorp Ltd and German rally-raid specialists Speedbrain GmbH, is set to compete in the six-day long Afriquia Merzouga Rally in Morocco. 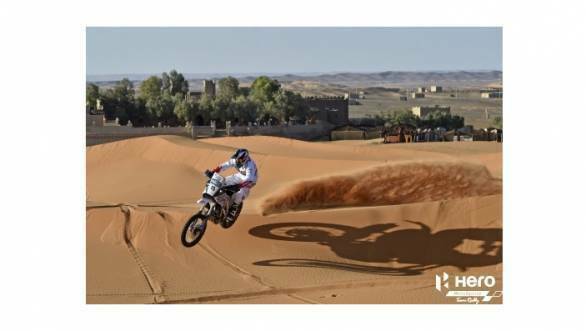 The event, which will start with a prologue on the evening of 22nd May 2016, will feature the team's two riders CS Santosh and Joaquim 'J-Rod' Rodrigues piloting Speedbrain 450 rally motorcycles. After the prologue, the event that is now a part of the Dakar Series will feature over 1,000km of running during the five competitive stages. "This is a new experience for me," said Rodrigues. "I don't know exactly what is in front of me during the next days. I will try to learn the maximum I can. Thanks to everyone at Hero MotoSports Team Rally for their support throughout the preparation process. My goal is to finish the race and see where I'm at." Of course, Rodriques is a Motocross legend, with a wealth of experience, although the rally-raid format is new to him. "I'm really happy to be here at the Merzouga," adds CS Santosh. "My first encounter with the bike has been exciting. I'm delighted to see we are progressing nicely, obviously working towards the Dakar. It's good to do some training with the roadbook. I'm trying to have a good result." We will keep you posted on how the team performs.